← HOW DO YOU IMPROVE CELESTIAL FIREWORKS? WELL, WITH TERRESTRIAL FIREWORKS! Photo By: Thierry Legault as taken from Mont-Saint Michel, Normandy France (links below). The 3 planet conjunction of May 26, 2013 was a great sight to behold so; as I did with Comet C/2011 L4 PANSTARRS I will display my favorite photos of the occasion, all taken by different brilliant photographers. As I said this was a great sight to witness but did anyone actually stop and think about the details in what you witnessed? As far as I’m concerned, that’s what makes events like this so remarkable. In many eyes it’s even more so than the visual spectacle itself. Let’s take a quick walk through starting at the top of the triangle (Yes, it’s a triangle, not a pyramid as a triangle is 2 dimensional, pyramid are 3). Mercury (Hermes when it follows the Sun), in this conjunction is actually closer to us than Venus is. That’s right Mercury as we see it here is 80% illuminated at 5.7” (arc-seconds) in size and 105 million mi (170 million km) away from us. Transition now to Venus (The Evening Star when it follows the Sun), the bottom planet in this trio. As we are viewing it here it’s 95% illuminated at 10” (arc-seconds) in size and it’s on the other side of the Sun at a distance of 150 million mi (250 million km) placing it 25 million miles more distant from Earth than Mercury even though Venus is almost twice as far away from the Sun as Mercury……pretty cool right?! That brings us to Jupiter on the left, who is reaching superior conjunction with the Sun soon, which means it will be as far away as it will get from Earth in its orbit. Right now, in this photo it is just about 100% illuminated at 32” (arc-seconds) in size at a distance of about 565 million mi (910 million km) from Earth. Its incredible size is the reason that it maintains such a bright apparent magnitude. Watch as the days go on as Jupiter sinks lower on the horizon en route with its date with the Sun. So as this beautiful planetary dance continues for the rest of the week, go check it out and view it not just as a beautiful sight but realize you are witnessing the clockwork of the solar system itself at work. 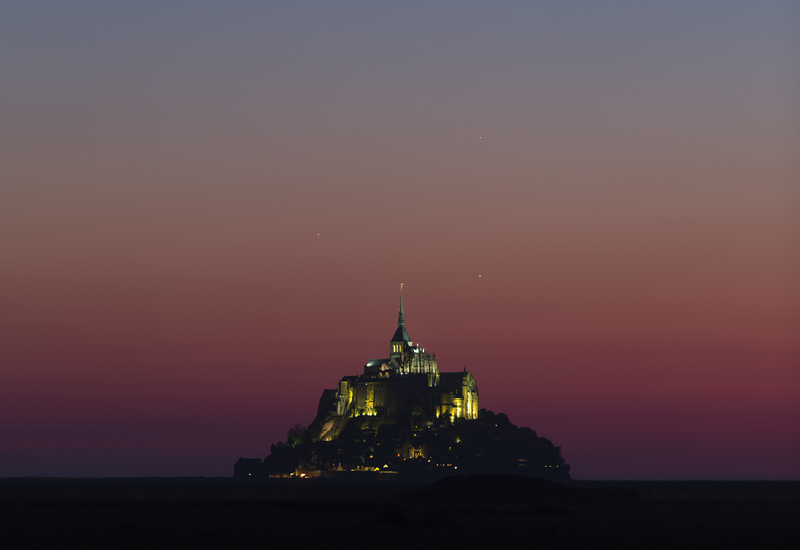 Image | This entry was posted in Astronomical Events, Astronomy (Learning), Astrophotography (Wide Field), Images, People, Solar System and tagged Conjunction, Jupiter France, Mercury, MontSaintMichel, NASA, Normandy, Planet, Planets, Space, Thierrylegault, Venus. Bookmark the permalink.